Bed bugs have been a plague over the last 10 years. Part of the reason for their resurgence is their resistance to the chemicals that used to keep them at bay. Now that they’re back, insecticide developers have worked day and night on new ways to combat them. As a result, we have more options than ever to kill bed bugs and make sure they don’t come back. Two of the most common bed bug sprays you’ll see or hear about are Bedlam Plus and Temprid Ready-to-Spray. Developed around the same time, both sprays have become must-haves in the bed bug arsenal. But what sets these sprays apart? Which spray works best for your needs? Let’s take a closer look and find out. In the past, bed bug eradication involved DDT and organophosphates. Both of these methods proved to be very dangerous for both humans and wildlife. To make matters worse, bed bugs developed resistances to these methods of attack. This lead to an arms race between pesticide developers and the bed bugs they were aiming to control. In the 60s and 70s, scientists deconstructed the pyrethrins produced by the chrysanthemum flower. They developed synthetic alternatives called pyrethroids. These kill insects by keeping open sodium channels in their nerves, leading to paralysis and death. While this method proved effective against a wide range of pests, certain strains of bed bugs began developing a resistance to the attack. By metabolizing the pyrethroids before they reach the sodium channels, a resistant bed bug can break down the chemicals before they have any effect. The latest generation of insecticide combos now feature dual-action formulas. These combine a fast-acting pyrethroid with a long-lasting residual control method. Some products also include a synergist that enhances the insecticide effect or helps to prevent bed bugs from metabolizing the pyrethroid. Only a few years ago, pest control professionals had to kill bed bugs using sprays designed for other pests. That’s not to say the sprays weren’t effective — if they weren’t, the pros wouldn’t bother. But the growing resistance of bed bug strains to modern chemicals proved that manufacturers needed to target them directly. MGK was the first to market with a product designed specifically for use against bed bugs: Bedlam. By combining the modern pyrethroid sumithrin with a synergist, Bedlam was able to achieve long-lasting residual control of even the latest pyrethroid-resistant strains of bed bugs. As you’d expect, it flew off the shelves. Bedlam Plus is MGK’s latest iteration on the Bedlam formula. They took that same synergized pyrethroid and combined with it a long-lasting neonicotinoid. Imidacloprid can stay effective for up to two weeks, long after the sprayed material dries. Bedlam Plus was the first solution to offer a quick knockdown and a reliable long-term control. Temprid was at first targeted only to pest management professionals. The original concentrate, Temprid SC, was the first release of a new dual-action formula with a micro-encapsulated design. This allowed the residual effect to work even longer than other liquid concentrates. The formula chosen for Temprid is similar to what Bedlam Plus pioneered. By combining the fast knockdown of beta-cyfluthrin with the systemic residual control of imidacloprid, Temprid makes sure that an infestation goes down and stays down. 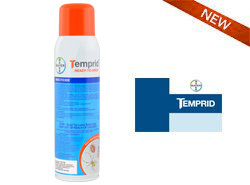 Temprid Ready-to-Spray packs the proven performance of Temprid SC in a simple spray can. No more measuring and mixing — just shake up the can and you’re ready to go. The unique bag-on-valve technology uses no added solvents or propellants. Which Bed Bug Spray for You? Now that you’re all caught up on what these sprays do, you’re probably still wondering which is the best option for your needs. The good news is that you can’t go wrong: these are both proven, professional-strength bed bug sprays that get results on any strain of bed bug. They both feature modern, dual-action formulas and have flexible labels for indoor applications. Both Bedlam Plus and Temprid Ready-to-Spray are low-odor, non-staining solutions. You can spray them on wood, carpet, upholstery, mattresses, and other fabrics. They were also both designed with pyrethroid-resistant bed bugs in mind. So how do these two stand out from each other? One important detail is where they can legally be purchased and used. While Temprid Ready-to-Spray is legal in most states, it’s not registered for use indoors in New York. Meanwhile, Bedlam Plus is legal in all 50 states, though it’s an aerosol product and can’t be shipped to Alaska or Hawaii. Temprid Ready-to-Spray uses a bag-on-valve technology that makes it safe for air travel, so it’s cleared for takeoff to those states. The other difference that is important for some cases is the residual effect. Bedlam Plus works effectively for up to two weeks, as long as the applied surface stays dry. 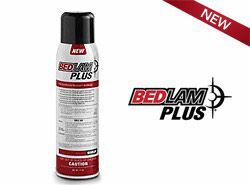 But Temprid Ready-to-Spray can continue to kill bed bugs for up to six months, long after Bedlam Plus wears off. But this isn’t a factor worth sweating if you follow our recommended 4-step solution: we recommend re-applying your contact and residual sprays every two weeks at least three times. After three applications over a six-week period, there shouldn’t be any bed bugs left for Temprid to continue killing. An effective bed bug treatment is all about choosing the right tools for the job. This not only means using effective bed bug sprays, but it means combining those sprays with other treatment methods. Bed bug treatments are more involved than other pests, due to the nature of bed bugs themselves. None of our bed bug sprays will do the job on their own — if they could, that’s all we would sell. Every product we recommend needs to be part of a holistic treatment system, such as the one outlined in our proven 4-step solution. Temprid Ready-to-Spray combines the fast-acting, broad-spectrum control of beta-cyfluthrin with the systemic residual control of imidacloprid to provide premium performance and efficacy.